"A matching game to identify different occupations using 28 pictures. 14 self-correcting puzzles cu..
Annie Rapid Calculation A game to test your Mathematical skill,calculations and operation. It is ..
"Find and Match the correct tool to solve the problem and complete set. 14 three piece sets, Activi.. This puzzle introduces children to the capital letters. The bright colourful pictures fit only with.. 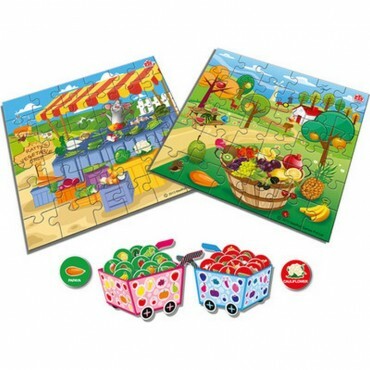 Packed in this cute little box is a delightful learning adventure for your evercurious little one Discover loads of delicious Fruits in the beautiful garden Jigsaw Puzzle. Also visit Mr Rattyrsquos Vegetable Shop on the hill side amp collect all the nutritious green vegetables from him. 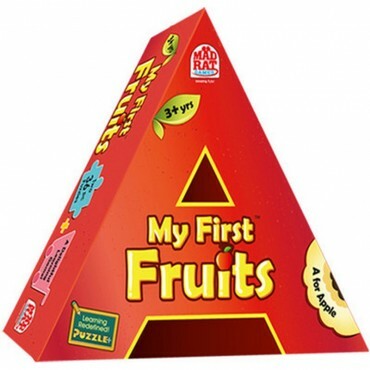 After you complete the two Puzzles play an exciting spotting game to double your fun amp learning. 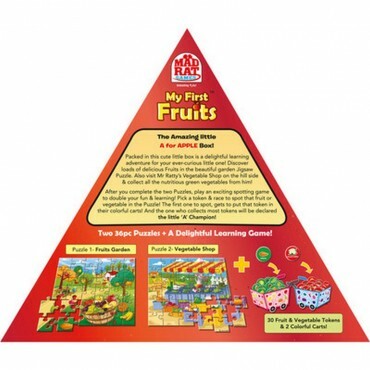 Pick a token from the cloth bag amp race to spot that fruit or vegetable in the Puzzle.